Could Donald Trump Have Made More Money in an Index Fund? I’ve seen this theory advanced by multiple sources, including the attached clipping, which I saw on Facebook. I don’t know the original source, but the finger-painting reference is a clue that the author has an anti-Trump agenda, hasn’t done the math and is just repeating something that may or may not be true for the benefit of anyone predisposed to believe it. By putting his inheritance into the stock market back in the 1970s, [Donald] Trump might have been “really rich” without all the drama. . . . Had the celebrity businessman and Republican presidential candidate invested his eventual share of his father’s real-estate company into a mutual fund of S&P 500 stocks in 1974, it would be worth nearly $3 billion today, thanks to the market’s performance over the past four decades. One big problem with that analysis: Donald Trump didn’t have an inheritance in the 1970s. His father, Fred Trump, was alive until 1999. When the author talks about Donald Trump investing his “eventual share,” what is he talking about? You can’t in 1974 invest an inheritance that you’re not going to have until 1999. How much money exactly did Trump inherit? I couldn’t tell you, but working backward from the National Journal analysis, in order to have $3 billion today, you would have had to invest about $35 million in the S&P 500 in 1974. 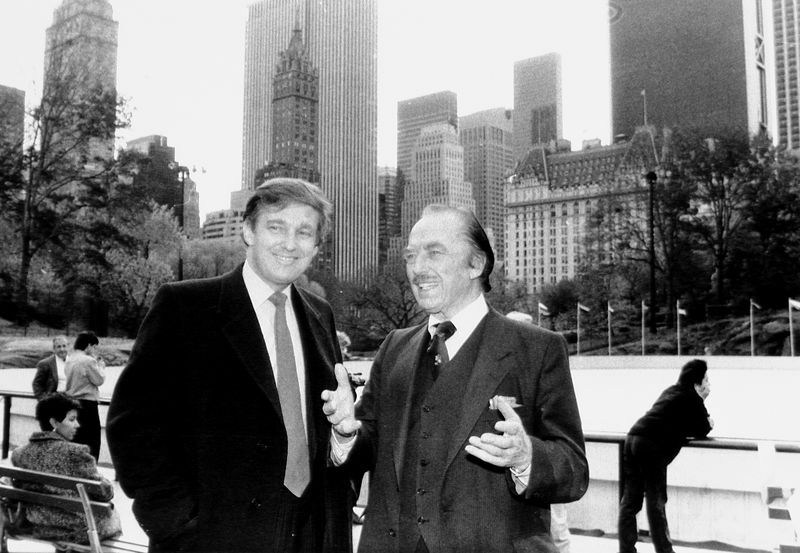 Fred Trump died in 1999 with a net worth of $250-300 million. 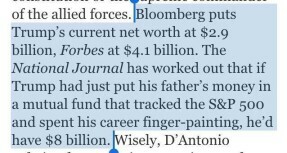 He had five children, one of whom predeceased him, so after estate tax and perhaps some charitable bequests, $35 million per child should at least be in the ballpark. Had Donald Trump invested that amount in the S&P 500 when he actually received it in 1999, it would be worth about $70 million today, which is not bad, it’s more than I’ve got, but it wouldn’t make him a billionaire. If he’d invested the $200 million that Forbes magazine determined he was worth in 1982 into that index fund, it would have grown to more than $8 billion today. The math is right . . . the S&P 500 has increased about 4,000% since 1982. But why 1982? The author selected 1982 for a reason, although he doesn’t say what the reason is. He tosses off 1982 like one date is as good as another so let’s go with 1982, and relies on readers not knowing or caring what he’s up to. In 1982, the stock market had been flat for almost 15 years, after which it took off on the greatest bull market in history. Today, in 2015, anyone can tell you that you should have invested your entire net worth in the stock market in 1982. 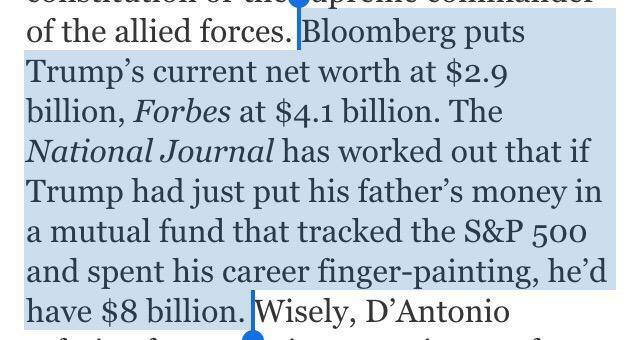 Even a modest $25,000 investment in 1982 would have allowed you to take up finger-painting and still be a millionaire today. Making great investment decisions retroactively is very easy, like taking a test when you already know the answers. The author dishonestly uses the S&P 500 as a proxy for average economic performance but picks a starting point, 1982, from which stock market performance was not only not average, it was historically unprecedented. It was the optimal investment point in American history. Same objection applies to his previous example of a hypothetical S&P 500 investment in 1974. Why 1974? 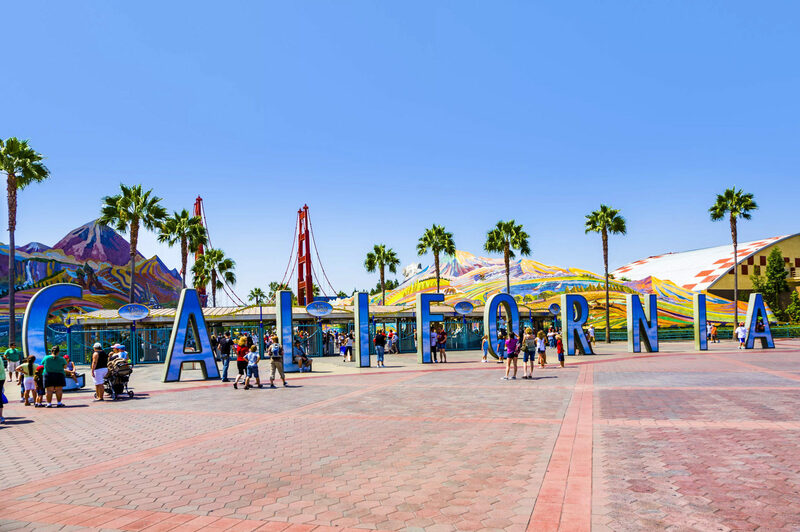 Because in 1974, the stock market was lower than any point since the early 1960s, and in hindsight can be identified as an optimal investment point for maximum return. By nature, Trump is both a narcissist. As a result, appearance is more important than substance. Thus, in this case, appearing to win ranks higher than actual gains. Listen to me for a day … an hour! … a moment! lest I expire in my terrible wilderness, my lonely silence! O God, is there no one to listen?